On Dec. 5, Lilly Endowment shared news of $48 million in grants for 17 projects as part of its Strengthening Indianapolis Through Arts and Cultural Innovation initiative. Designed to “encourage community building and celebrate creativity,” this one-time competitive grant program supports a broad swath of projects and initiatives across the city — including $3 million toward Big Car Collaborative’s ongoing efforts to support its home block just south of Garfield Park on the near southside. Document the project and community impact with, video, photos, and stories that will be shared online and Big Car’s communityradio station, WQRT, along the way. Other partners on the project include: Garfield Park Neighbors Association, Bean Creek Neighborhood Association, Indianapolis Neighborhood Housing Partnership, Riley Area Development, University of Indianapolis, Solful Gardens, the City of Indianapolis, Rundell Ernstberger, Deylen Realty, Blackline Studio, and Pattern. As the project develops this group of artists and leaders working and living in this micro community will focus on supporting this currently challenged block located in the Garfield Park neighborhood, the near southside, and neighborhoods around Indianapolis. This ongoing and consistent work will focus on inclusive, informal arts practices that share the joy of creative expression in engaging ways, bring citizens together, and boost quality of life for people of all ages and backgrounds. Cruft Street Commons builds on $2 million-plus in public and private investment already on the block at Tube Factory (home of a community gathering and exhibition space and workshop), sound art gallery Listen Hear (home of Big Car’s FCC-licensed FM radio station), and the fully funded affordable homeownership program on Cruft Street in partnership with Riley and INHP. With this next phase, Big Car teams up with experienced and dedicated partners to create a socially, economically, and environmentally sustainable micro-community that supports equitable, collaborative, and positive macro-level change throughout the city. This plan is what Australian scientist Bill Mollison would call “social permaculture” and what sociologist Eric Klinenberg calls “social infrastructure.” Big Car, an artist-led organization founded in 2004, is saving and repurposing visible structures — buildings and outdoor gathering spaces — to develop equitable and inclusive social infrastructure. Cruft Street Commons is located less than a block away from Garfield Park, a new Red Line station and an existing BlueIndy electric car share hub. Its location offers a bike-friendly route to the Indianapolis Cultural Trail in Fountain Square via Pleasant Run trail 1.5 miles to the north and a quick trip to the University of Indianapolis 1.5 miles to the south. Cruft Street Commons is located within overlapping neighborhood boundaries. One is the well-organized Garfield Park neighborhood adjacent to the city park full of amenities. And the other is Bean Creek — a community making great strides despite challenges as a low-income neighborhood. On this uniquely mixed-use block between Shelby Street and I-65 and bordered by Cruft Street and Nelson Avenue, Big Car enjoys a rare opportunity to repurpose and build an equitable, inclusive pocket community that will serve as a sustainable and affordable catalystfor quality of life in the surrounding neighborhoods, the southside, and around the city — while avoiding displacement. “We’ll secure long-term affordability for artists while supporting neighbors in staying to enjoy a socially cohesive block,” said Walker. This happens, in part, by establishing bonds between new and existing neighbors. “What drives us from places is the lack of connection to others. It is in connection that we build safe, functional, cities,” psychologist Mindy Thompson Fullilove wrote in her 2013 book, Urban Alchemy: Restoring Joy in America’s Sorted-Out Cities. This idea directly addresses primary goals in the South Indianapolis (So Indy) Quality of Life Plan created by residents in eight southside neighborhoods, including Bean Creek and Garfield Park. Certified by the City in 2017, the plan is now in its implementation stage with full-time staff and neighbors leading the way. Related So Indy goals include increasing mixed-use and quality rental housing, boosting job opportunities with an emphasis on trades, focusing on healthy food and gardens, increasing small businesses, and fostering social connectivity with affordable public programs. Another key component of the Cruft Street Commons project is providing Indianapolis artists and owners of creative businesses a long-term home neighborhood they can afford — one directly owned by a nonprofit committed to keeping rent prices low for residential and studio space. After Fountain Square’s Wheeler Arts Community went market rate in 2017, Indianapolis no longer offered any affordable housing specifically for artists. And, due to market forces, artists and creative small businesses like galleries have moved from neighborhoods they once sparked with energy. This cultural migration and disbursement not only makes things difficult for the artists; it also alters the authenticity, quirkiness, and cultural vibrancy of neighborhoods like Mass Ave and Fountain Square — the very kind of quality places that help Indianapolis retain young talent, a key issue according to studies by the IU Public Policy Institute. Data from its 2015 Thriving Communities Thriving State report shows that Indianapolis has been losing residents for 15 years, with 10,000 people leaving Marion County in 2015 alone. This multifaceted project is an expansion of Big Car’s existing work — also on the same block — that includes five affordable artist-owned homes developed as the Artist and Public Life Residency (APLR) in partnership with Riley Area Development and supported by INHP. The APLR project — which will begin taking a second round of applications soon — is fully funded and artists will occupy homes in 2019. Cruft Street Commons is linked directly with APLR as well as our program with two existing artist residency houses Big Car owns and manages separately on Cruft Street. These houses, currently occupied by short- and long-term artists in residence — border the green space thatincludes our community gardenand chicken coops. The greenspace is also home tothe Indianapolis Bee Sanctuary, a public art and ecology project created by St. Louis artist Juan William Chávez and the Big Car team. Big Car has hosted several artists in its short-term residency program and four in our one-year residency program in these houses since 2016. And the two houses have both been utilized for exhibitions and other cultural programming — both inside the houses and in the greenspace. Artists who purchase affordable houses in the partnership with Riley or live in or visit Big Car’s affordable rental or residency houses on the block will be engaged in neighborhood cultural work through the same program as the Cruft Street Commons studio and home renters. As part of building common spaces for artists, neighbors, and visitors, Big Car is also renovating additional flexible programmatic and community space. This includes 20-25 flexible art studios at the 44,000-square-foot second former Tube Processing factory building along Nelson Avenue. This building is located directly behind our short-term residency houses and just southeast of Big Car’s existing community and cultural space, Tube Factory. 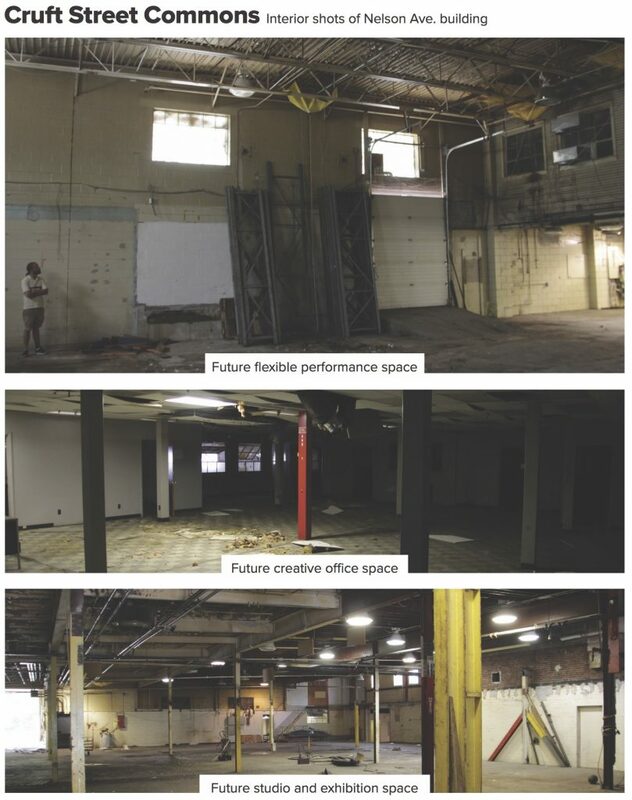 In addition to these long-term affordable artist studios (something our city is lacking due to changes in neighborhoods like Fountain Square), Big Car plans to add exhibition space, a flex black-box performance and event area, office space for creative/cultural nonprofits, shared shop and repair area, and additional community workshop space. Cruft Street Commons residents will receive access to shared resources and performance space. Artists and nonprofits in the discounted studios and office space will also be involved as part of the team working in support of the community. As part of the program, Big Car will ask artist and community leader residents — all of whom receive discounted, below market-value housing, studios, and access to shared resources and spaces — to get involved as part of a bigger civilian service corps teaming up with community members to work as problem solvers and community connectors/builders for stronger social cohesion. This structure for artists supporting the community, already part of our artist homeownership program, will also be linked to a shared-equity rent program. This will allow artist renters to take some money with them — possibly for down payment on a home or other uses — when they move out of the program. The civilian service corps exchange is something residents selected for the program will formally agree to do (with shared equity dollars linked to participation). With the South Indianapolis Quality of Life Plan’s goals and broader societal and civic challenges in mind, Big Car is building Cruft Street Commons as a sort of micro cohousing community with arts-based social connectivity as its core mission. Cohousing communities are places found around the world where neighbors know each other, enjoy common spaces, and work together on shared goals. As sociologist Robert Putnam shared in his 2000 book, Bowling Alone, almost half of Americans say they have no one, or just one person in whom they can confide. “Social isolation just may be the greatest environmental hazard of city living,” Charles Montgomery wrote in his 2013 book Happy City,an examination of the impact of social cohesion on happiness. “The more connected we are with family and community the less likely we are to experience colds, heart attacks, strokes, cancer, and depression.” He also shared that, if 10 percent of Americans had someone to count on in life, this would have a greater effect on national life satisfaction than giving everyone a 50 percent raise. It is well worth noting that Indianapolis ranks 133rd of 186 cities in the 2017 Gallup-Sharecare Well-Being Index, the leading study of American happiness and health. “In response to the challenges caused by unhappiness and social disconnect in our home city, we’re building this pocket neighborhood to promote social cohesion for those who will live and work there, all neighbors, the broader community, and visitors from anywhere,” Walker said. Cruft Street Commons will foster sense of place, prioritize people over cars, and share resources like lawn mowers, appliances, and tools among artists in the program and other neighbors as well. Like other cohousing communities Big Car has studied, this will be a place where people care about each other and shared physical spaces — and support neighbors. Regular community meals, shared workshop and gathering space, and community collaborations will help incubate ideas and form ongoing bonds and collaborations between artists living and working here. Cruft Street Commons will feature outdoor and indoor spaces where neighbors connect with each other spontaneously or at planned activities like shared meals at Tube Factory — already a central civic commons for the southside and broader community. “Connecting neighbors through meals and other approaches to community engagement is crucial to quality of life and individual happiness. And we’ll start on our block and bring this kind of approach, with leadership from the community of artists, to neighborhoods across the south side and the entire city,” Walker said. Dan Buettner, author of the 2017 book The Blue Zones of Happiness, is an expert on places where people live long and happy lives. In the early 2000s, he began studying “Blue Zones,” areas of the world where a high percentage of people live to be more than 100 years old. His book, published in 2009, shares that a cornerstone of a long and healthy life is living in a happy, socially connected way. And he writes that communities can be retrofitted to encourage happiness and social cohesion. Combined with other factors, such as encouraging healthy eating and activities like walking and biking, Buettner believes creating mini “Blue Zones” is a realistic approach to boosting quality of life (and longevity) for people. Buettner also shares that individual happiness is affected by how close members of social networks live to each other. When a friend who lives within a mile becomes happy, you are 25 percent more likely to become happy yourself as a result. But the happiness of a friend who lives further away has no impact — more support the strength of a micro-community like this one where neighbors bond over shared interest and purpose. Most cohousing and micro community projects are built with an internal focus on the people who live within the property boundaries. Cruft Street Commons will function as a more inclusive kind of community that is porous and invites all neighbors in — including those outside of the program — to develop deeper relationships and better know and support each other. This approach is something our research indicates is not happening in many other cohousing projects. “It’s an act of outward-looking leadership, a leadership that is concerned not only with the well-being of the institution itself, but also with the well-being of the greater community it seeks to serve and represent,” Rip Rapson, president of the Kresge Foundation, said of this kind of cultural development in a 2016 speech. Strong connection between neighbors and artists at Tube Factory is already happening as Big Car staff artists are in constant communication and collaboration with nearby residents. Attendance at Tube Factory events is often more than 50 percent neighbors. And residents on the Cruft Street block participated in the selection of artists chosen for the home ownership partnership with Riley. And Big Car will team up with community leaders, when invited into neighborhoods beyond our own, to support and program “third places” — like community centers, coffee shops, placemaking plazas in parks, etc. — where people can connect with others beyond home or work. Sociologist Ray Oldenburg wrote in his 1999 book The Great Good Place: “To comprehend the importance of the informal public life of our society is to become concerned for its future. The course of urban growth and development in the United States has been hostile to an informal public life; we are failing to provide either suitable or sufficient gathering places necessary for it. The grass roots of our democracy are correspondingly weaker than in the past, and our individual lives are not as rich.” One of the jobs of creating great third places is offering places for people and places for interaction, conversation, and learning between generations. “Third places provide a means for retired people to remain in contact with those still working and, in the best instances, for the oldest generation to associate with the youngest,” Oldenburg wrote. And Big Car will turn talk into action with artists and neighbors in the lead addressing challenges. 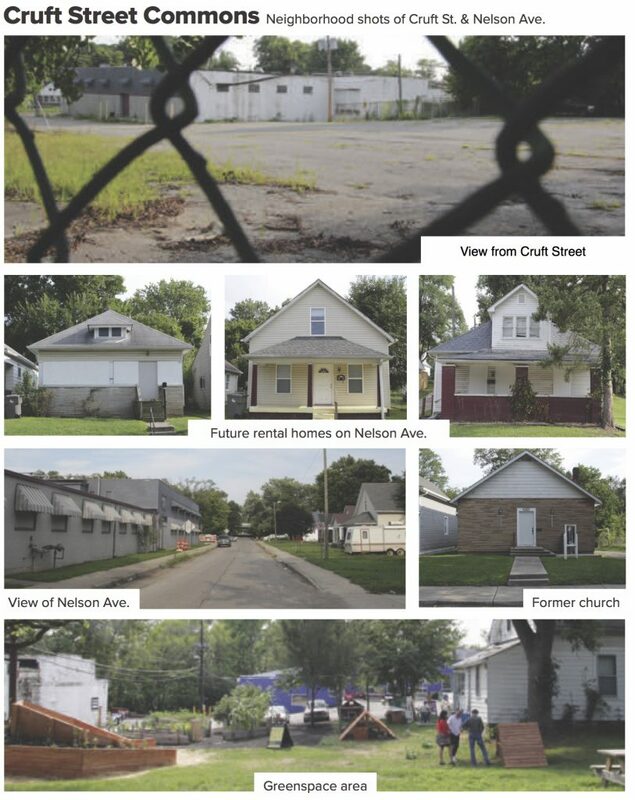 A 10-year study by the University of Michigan of-Flint, Michigan shows that neighbors making their streets “busy,” cleaning and beautifying abandoned properties, and turning some into programmed pocket parks led to drastic drops in crime — assaults decreased 54 percent, robberies 83 percent, and burglaries 76 percent between 2013 and 2018. This is the kind of work our crew of artists will help make possible — together with neighborhood leaders — on the southside of Indianapolis and around our city. This is certainly a large and multi-faceted and challenging effort. But Big Car has taken steps toward owning and managing property and working with larger groups of artists. And it is teaming up with some of the city’s best experts in all aspects of this work. For instance, this is not an excessively large project for key partners including CICF, Deylen, Rundell Ernstberger, Blackline Architecture, and Indiana University Public Policy Institute. Leaders from each of those entities express full confidence in the project and in the team assembled to get it done. The Learning Tree — an ongoing partner in multiple ways, including an INHP-funded home repair project and exhibit of neighborhood art on discarded doors — will facilitate connecting artists with inclusive community-driven work elsewhere around the city. The Learning Tree is a grassroots association of neighbors specializing in asset-based community development and education. “Knowing people and having connections starts with our biggest currency, which is trust,” said DeAmon Harges, founder of The Learning Tree. The South Indianapolis Quality of Life Plan organization — which includes a paid full-time director, volunteer board, and representatives from eight neighborhoods and seven action teams (community building, connectivity, education and workforce, health and wellness, housing, Madison Avenue, and Shelby Street corridor) — will connect artists and leaders in Cruft Street Commons with projects and initiatives. The University of Indianapolis is a key partner with So Indy QoL as its original convener — before handing this off to Big Car in 2017. And UIndy will team up with us on Cruft Street Commons and expand partnerships like we have with the Social Practice and Placemaking graduate program, now in its second year and a full partnership with Big Car utilizing Tube Factory as a base of operations for classes, community interaction, and exhibitions. Why Big Car, why now? As a nonprofit arts organization and collective of artists and community leaders, Big Car Collaborative has worked for 15 years strengthening and supporting Indianapolis, its neighborhoods and its people through equity-focused, arts-based approaches. “Our work is built on community engagement, co-creation, and collaboration with many citizens, artists, organizations, and entities. This focus of being part of solving problems as artists has been at the core of our mission all along,” Walker said. Big Car began as neighbors and artists bringing creative energy to the mostly vacant Fountain Square commercial district in the early 2000s. 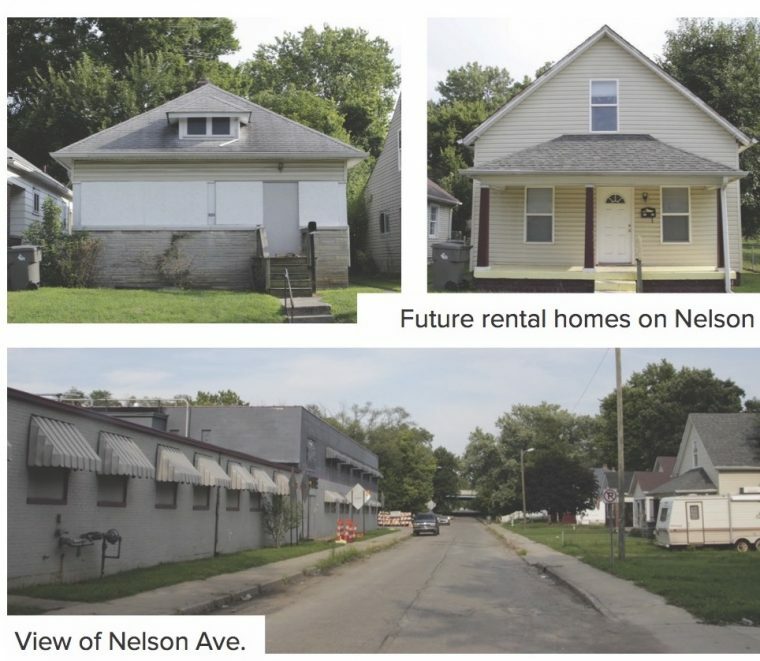 In 2009 at the height of the recession, the organization received a Great Indy Neighborhoods Initiative (GINI) Imagine Big grant that connected its artists to eight neighborhoods. Here, Big Car followed its mission of bringing art to people and people to art by collaborating with neighbors in West Indy, the Near Eastside, Near Westside, Southeast, Martindale Brightwood and more. While working on the Imagine Big project in Lafayette Square in 2010, Walker spotted an abandoned tire shop that seemed perfect for a cultural community center. With no up-front funding but with lots of volunteer support, Big Car’s artists and volunteers transformed this eyesore into a 12,000 square-foot hub for culture and community with a massive raised-bed community garden that doubled as a park where people could gather in front of Lafayette Square Mall. In 2015, Big Car worked with the City of Indianapolis — with $400,000 in funding from the NEA, the City, and CICF — to spark Monument Circle with daily, human-scale activity and comfort while testing plans for the Circle’s redesign. And, now, we’re in the midst of reinvigorating a forgotten and neglected block in the Garfield Park neighborhood where we first began work with a collaborative gateway mural as a gift to the community in 2012. Big Car’s idea for Cruft Street Commons grew out of much experience, from years of talking with neighbors, attending community meetings, creating neighborhood logos with fourth graders, digging sweet potatoes out of the dirt next door to Don’s Guns, painting creative crosswalks, taking boards off windows of buildings vacant for 15 years, and helping give voice to people across the city who’ve been left out for too long. Buettner, Dan. The Blue Zones of Happiness: Lessons From the World’s Happiest People. National Geographic, Washington D.C. 2017. Fullilove, Mindy Thompson. Urban Alchemy: Restoring Joy in America’s Sorted-Out Cities. New Village Press. 2014. Helliwell, John. “Trust and Well-Being.” International Journal of Wellbeing, Vol. 1, No. 1, pp. 42-78. 2010. Indiana University Public Policy Institute. Thriving Communities Thriving State. Indiana University Press. 2015. Klineberg, Eric. Palaces for the People: How Social Infrastructure Can Help Fight Inequality, Polarization, and the Decline of Civic Life. Crown, New York. 2018. Mollison, Bill. Permaculture: A Designers’ Manual. Tagari Publications, Tyalgum, Australia. 1988. Montgomery, Charles. Happy City: Transforming our Lives through Urban Design. New York: Farrar, Straus and Giroux. 2013. National Endowment for the Arts. When Going Gets Tough: Barriers and Motivations Affecting Arts Attendance. NEA Research Report #59, January 2015. Oldenburg, Ray. The Great Good Place. Da Capo Press, Cambridge, MA. 1991. Putnam, Robert. Bowling Alone: The Collapse and Revival of American Community. New York: Simon & Schuster. 2000. Solomon, Daniel. Housing and the City, Love Versus Hope. Schiffer Publishing, Atglen PA. 2018.
in Unexpected Places. Chicago Center for Arts Policy at Columbia College, June 2002.